Stay at stylish hotels on two of the Caribbean’s most popular islands – Antigua and Barbados. 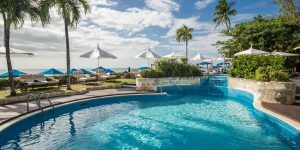 Take in the lively atmosphere of Falmouth Harbour while staying at South Point, then stay at The House, an adults-only hotel on the platinum west coast where guests can simply relax. 10 nights from £2855 per person including all flights, transfers and bed and breakfast. Sample price is for travel in low season, staying in the lowest room type and include current special offers. Call us on 01752 880880 or email [email protected] to discuss your next holiday to the Caribbean – all our holidays are tailor-made so we can put together a suggestion including the best flights and hotels for you. 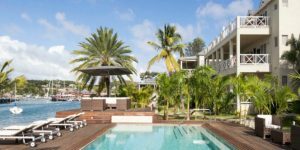 Begin your holiday at South Point in Antigua, a contemporary resort in the famous Falmouth Harbour, offering a chic experience in a lively location. Overlooking the marina, the property’s one and two bedroom suites are modern with panoramic views, each with a fully fitted kitchen and comfortable living areas. Although guests can self-cater if they wish, the restaurant serves dishes incorporating Asian, Mediterranean and Middle Eastern cuisine. The dining area is set on a deck which is suspended over the water, making it accessible to those using dinghies and paddleboards. 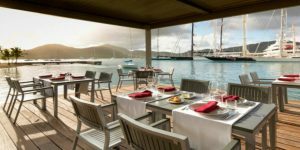 Guests can also easily walk to the restaurants and bars of English Harbour, an area which comes alive during the island’s main sailing events. Shirley Heights is also found nearby, a hilltop lookout point with fabulous views of the harbour which hosts a weekly party with music and barbeque food. Next to Falmouth Harbour lies historic Nelson’s Dockyard, a historic naval dockyard which is now a UNESCO World Heritage Site and houses a small museum, a restaurant and bakery. Slightly further afield, there is plenty to do throughout Antigua including watersports and numerous leisure activities. Visitors can pet stingrays and swim with tropical fish at Stingray City, discover Antigua’s history on a Jeep safari which takes in many of the island’s top tourist attractions, or enjoy a rainforest zip line tour. Click here to find out more about things to do in Antigua. A ninety minute flight takes you from Antigua to Barbados, with your next hotel located about 30 minutes drive from the airport. 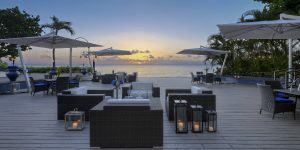 The House is a chic, adults-only hotel on the west coast of Barbados which offers understated elegance and an atmosphere of relaxed informality beside a pristine stretch of beach. Staff are on hand to cater to guests’ every need, from serving poolside drinks and booking beachside massages to arranging island excursions. Suites have been designed to make the most of the beachside setting, many with balconies boasting stunning sea views. Champagne breakfast, afternoon tea and evening canapés are all included in a stay here, with light lunches available from the bar and evening dining at Tamarind’s Daphne’s Restaurant. Guests staying at The House can also use other facilities at the neighbouring hotel including the spa and water sports. The stunning coastline of Barbados is known for its white sand beaches and clear blue seas, offering plenty of opportunity for relaxation or taking part in water sports. Away from the beach there are activities including golf and tennis, as well as motor racing at the Bushy Park race track. Other places of interest include rum distilleries, botanical gardens, historic mansions and military buildings, as well as historic towns including Holetown, Speightstown and Bridgetown. The rugged east coast of Barbados is well worth a visit as it provides a stark contrast to the more popular west coast, home to rugged surf beaches and a scattering of local villages. Click here to find out more about things to do in Barbados. Flights with Virgin Atlantic or British Airways in Economy from London Gatwick to Antigua and from Barbados to London Gatwick. Inter-island flights with a local airline from Antigua to Barbados. 5 nights’ bed and breakfast at South Point sharing a Deluxe Waterfront Suite. 5 nights’ bed and breakfast at The House sharing a Garden View Junior Suite. Prices are for travel in low season, are based on two sharing and include current special offers (as of 6 September 2018) – these are a guide only, contact us for a tailor made quotation. Conditions apply for all special offers including blackout dates, book by dates and minimum stays.